Within 250 miles of Fort Lauderdale, FL. 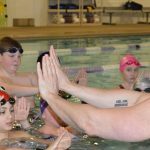 Cammile will lead two sessions designed for competitive swimmers of all ages and ability levels. Many swimmers dread butterfly races! 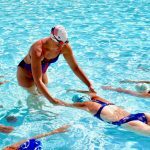 As a 200 fly specialist and Olympian, Cammile Adams knows the essential components to swimming butterfly races faster and more efficiently. After this clinic, butterfly might just become your favorite stroke! Body Position: Stay horizontal in the water and close to the surface to reduce drag and maximize your speed. Keep your hips high by pressing your chest each stroke. Arm Pull: Extend your arms forward and then utilize a strong catch with vertical forearms to put the pressure on the water in the correct direction. Keep your strokes long and maintain a narrow pull under your body. Cammile will help participants practice drills to know the proper pull pattern. Kick: The butterfly kick is very technical. Knowing how much to bend your knees and which muscles to engage in order to get the most out of every kick can be a challenge. Cammile is an expert on teaching the details to a fast fly kick. Watch and listen; she'll show you how. Breath: Most swimmers struggle with how to keep their breath as low as possible. Trust in Cammile and work on keeping your chin in the water when you take a breath. Timing: Timing is everything in butterfly. The way that the kick, pull, and breath work together will take a good butterflyer to a great racer! Change the way you think about the open turn! This is one of the most missed opportunities to drop time. Learn each step of the open turn from Cammile as she breaks it down into each piece. Listen closely to her tips and you'll be as fast as lightning at your next meet! Approach: Don't slow down! Accelerate into the wall and keep your body right on the surface of the water. A common mistake is diving down as you approach but this is like putting on the brakes. Core engaged, head down, reach with your fingertips. Tuck: Hips high as you tuck your knees into your chest. This initiates the backflip motion that you have to have to get through the turn fast. DO NOT turn around, spin! Arms: Learn how to drive your elbows to maintain your tight tuck as you flip bakwards. What does calling your mother have to do with turns? Cammile will let you know! Pushoff: Keep your core engaged and your knees pointed up and slightly to the side. as you blast away from the wall in a tight streamline. Observe Cammile swim at full speed and demonstrate a progression of perfectly executed drills to achieve powerful, efficient and fast swimming. Practice what you've learned by swimming at top speed with one of the best swimmers in the world! Hold on to your form while having the opportunity to challenge yourself. Take a photo while wearing the Cammile's medals, get autographs, and a gift from TYR Sport!